A few weeks ago Aidan and Jason attended their first "Daddy and Me" swimming lesson. Of course I had to go along and document this momentous occasion. Aidan is a water bug and usually can't get enough of the pool/ocean/lake when we go swimming. But, he did NOT enjoy his first swim lesson (atleast not ALL of it). I think he may have been a bit overwhelmed and overstimulated with his new surroundings. Even though there were only 3 other kids in his class (one of whom is his good buddy), there were also 3 other classes going on at the same time. 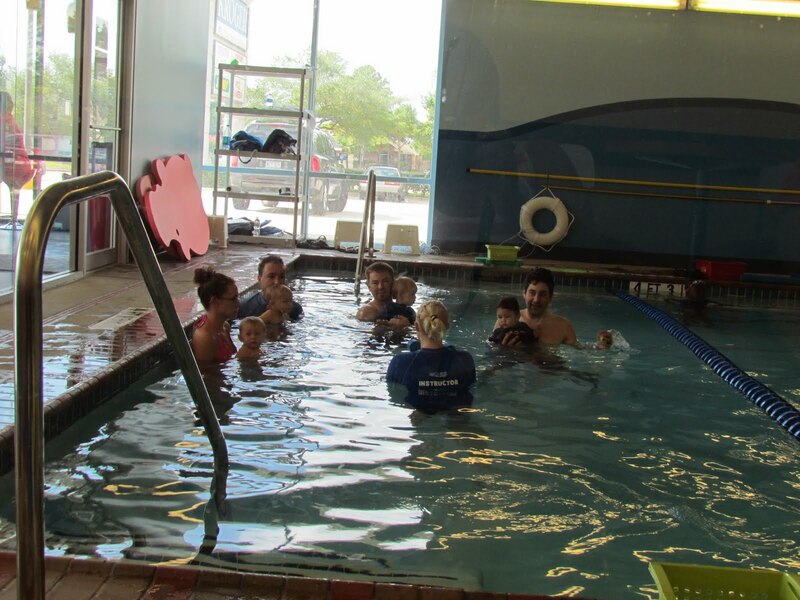 And the pool is glassed in and parents sit around outside of the glass to watch their kiddos... it also didn't help that Aidan was kinda freaked out by his teacher. She was wonderful, sweet and kind, but she was a STRANGER! My little guy doesn't do so well with strangers. 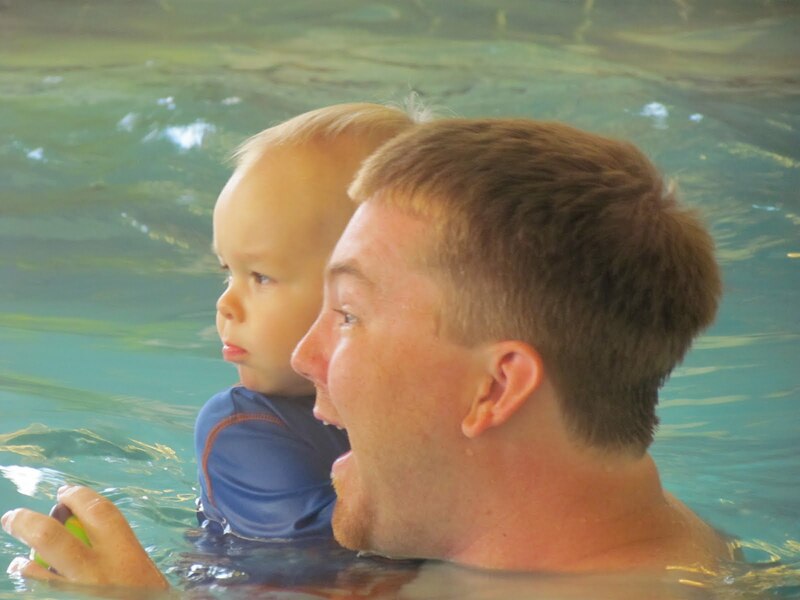 Especially ones who want to hold him in the water. They gave him a little water toy to hold onto for the whole class. 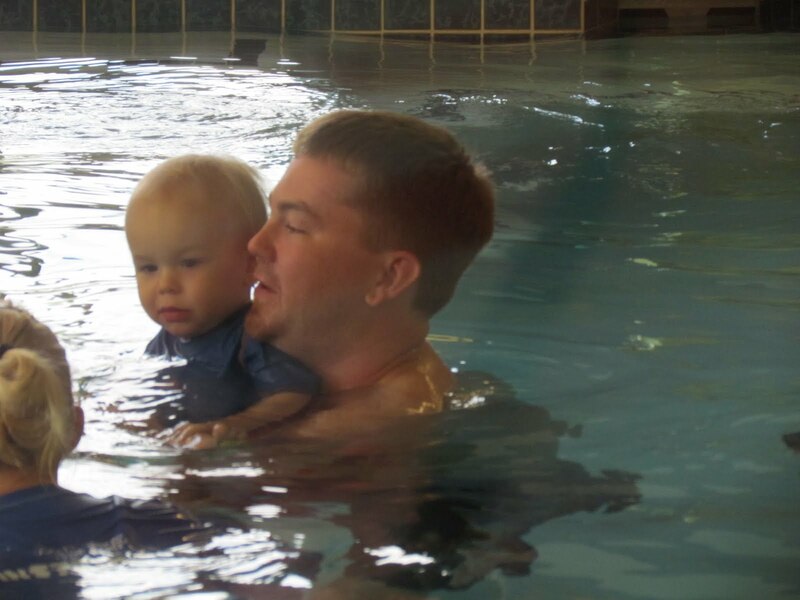 He really liked his and kept an iron grip on that little fish! 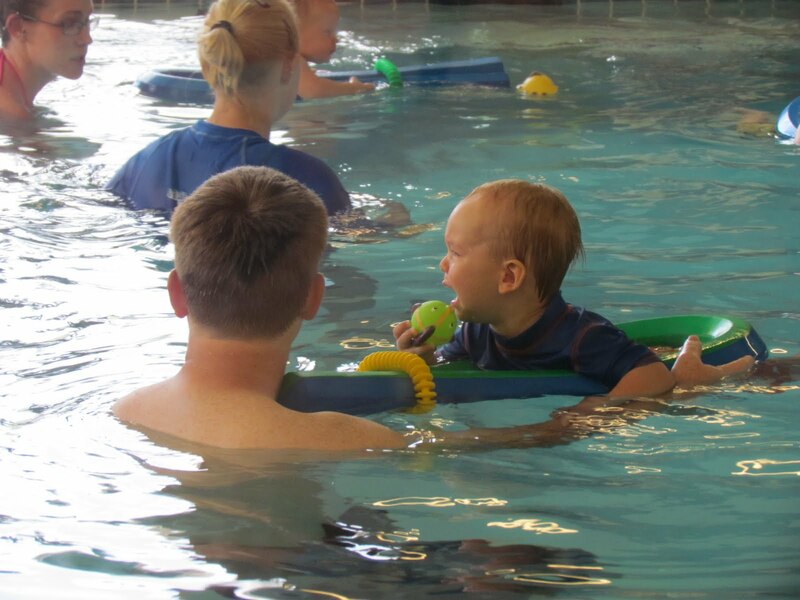 They practiced floating on their front and back, getting in and out of the water, blowing bubbles, kicking, being dunked under water, and "swimming" back and forth between Daddy and teacher. I think that once Aidan attends a few more lessons, he'll feel much more comfortable being there. He enjoys spending time with Daddy so much! I also love that they have something special that they do together. I feel bad sometimes because I am lucky enough to do so many "fun" things with Aidan.Jason definitely misses out. That's neat that they have daddy and me classes. 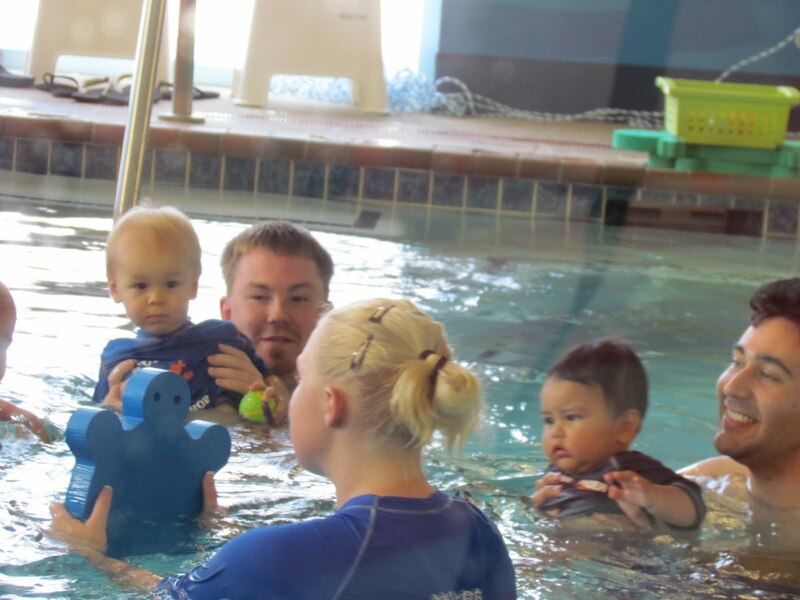 It seems like there are so many activities for moms. 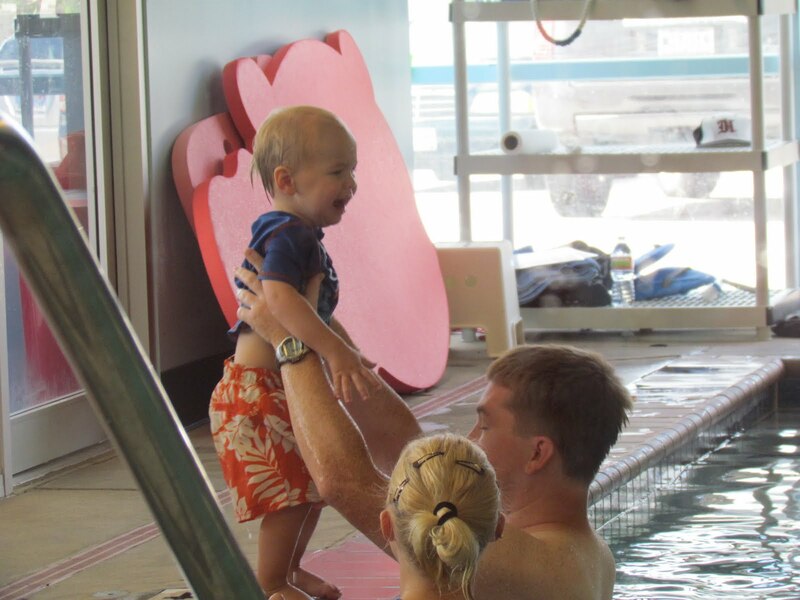 Yay for swim lessons! 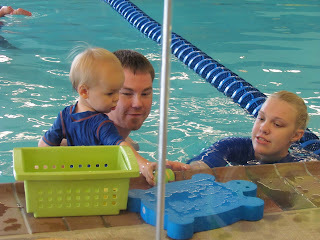 G did these 'parent/child' classes when she was little, and now she swims like a fish, no floaties needed! 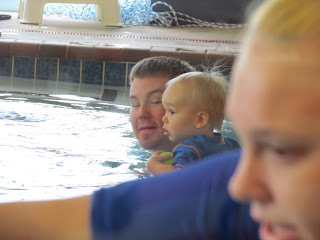 We did baby swim classes with Cate just before she turned a year old and haven't done anything since until this summer. 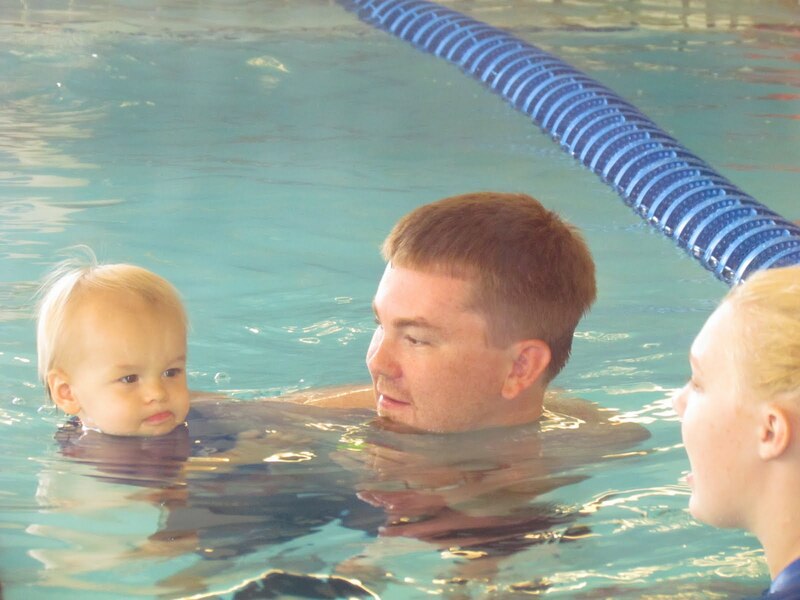 I kind of wish we would've repeated the baby swim class with her again at 18 months and last year at 2.5 because she had a little bit of fear going into swim lessons this year. Last year she was in a baby pool and her legs went out from under her and she ended up face down for a few seconds (she panicked and didn't know to just put her feet down). That was the beginning of last summer and ever since she's had this borderline fear of the pool. 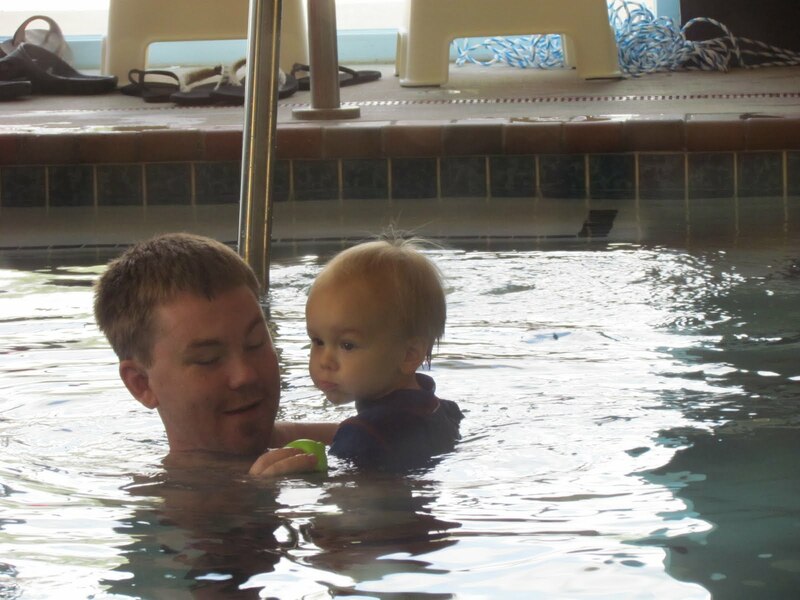 Thankfully, four weeks of swim lessons seemed to have eased her fears greatly. Hi, I'm Emily. Proud wife and stay-at-home-mama to my two little men and one sweet baby girl. Etsy shop owner, amateur sewer, crafter, chef, and home decorator. Target and Pinterest junkie. 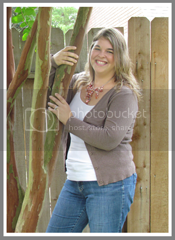 Lover of animals, DIY projects, books, blogs, rocky road ice cream, movies and a good deal. Life is beautiful! 8th Street Bridge, Copyright 2008-2014. Design by Designer Blogs. Powered by Blogger.